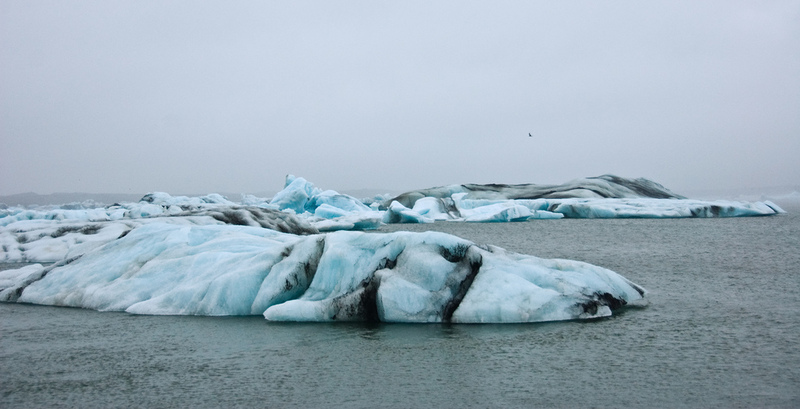 The Jokulsarlon is the most famous glacial lake in Iceland. It is also the largest among the numerous glacial lakes in the country. The Jokulsarlon or the Great Lagoon is so famous that several Hollywood movies were shot in this magnificent place. These movies include Tomb Raider, Batman Begins, and two James Bond movies, Die Another Day and A View To Kill. The lagoon was formed around 1984 when the Breidamerkursandur started retreating quickly. The 15-km lagoon in 1998 was originally 8 km in 1975. The glacier is still retreating. The Great Lagoon is just filled with magnificent icebergs due the breaking off of the Breidamerkursandur, which is a part of a large glacier Vatnajokull. These blocks of ice are carried to the sea via a short river. What people can actually sea above the water surface is just an astonishingly one-tenth of the total size of the whole iceberg. These icebergs are constantly eroded by tides and winds until it can actually float on the ocean. Boat trips or cruising is the most famous activity to do in this place. This gives the tourist the opportunity to take a closer look and take pictures of the wonderful sight. Cruising between the white to crystal blue icebergs gracefully floating on the soft, cold water just makes every moment worth capturing. People can actually go near the ice bergs and even witness its calving off. Jokulsarlon is also one of the favorite places of the skuas or big seagulls to visit. They are often seen during the summer where they build nests on the dunes around the area. Seals often swim in the cold water or play on top of the icebergs. One can never feel wrong with the majestic sight of the gigantic glaciers calving off to make another magnificent iceberg on the water, while seagulls, busy with their nests, and seals, enjoying diving, brings more life to what already exists in the Great Lagoon.